Nothing beats the simple joy of blowing bubbles. By making your own mixture and wand, you can enjoy an inexpensive afternoon of childlike pleasure. To make a cheap bubble mixture, you will need to mix 7 parts water with 3 parts detergent (so if you use 7 litres of water, you add 3 litres of detergent). For extra strong bubbles, you can add one part glycerin. Glycerin can be found in the cooking and pharmacy aisles of most supermarkets. It can be expensive but will make your bubbles far superior. Once you've combined your ingredients, let it sit for as long as you can. The longer you leave your mixture, the better it will be. You can make your wand using any sort of strong but flexible material you have on hand – coat hangers, floral wire or even straws work well. Simply bend your material into the shape you desire (try flowers, stars and different shapes) and voila! 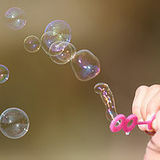 Different outliness will yield different bubbles so have fun experimenting.